During this years Men’s Health Week, we’d like to feature a guy whose life epitomizes the importance of practicing good health habits. Starting with getting a good night’s sleep and staying active, Rick Truttmann, CEO Alli’s Dad, will be our featured “wicked sleeper” this month. Make sure to read our other blogs on men’s health and the importance of better sleep and exercise and sleep on health. Practicing good health has been important to Rick his entire life. When he was younger, he and his brothers were outside constantly, playing baseball, football, and wrestling all around the neighborhood. It came as no surprise that a he landed a collegiate athletic scholarship to continue his pursuits in both football and wrestling. When asked about his training in and for college, Rick mentions two things that were very important to staying in shape and being successful, “No smoking and leaving everything you’ve got out on that field.” Clearly this was a mantra that worked for Mr. Truttmann. He has been inducted into his college’s Athletic Hall of Fame and still has numerous unbroken records in football. As a now 64 year old, soon to be retired businessman, Rick stays fit on two wheels. “When you grow up playing sports, especially contact sports, your body takes a beating.” Rick turned to cycling many years ago when his shoulders and knees began to show wear and tear. Now, it’s a part of his daily practice of good health. Cycling has been shown to not only stimulate the body physiologically, but it’s great for mental toughness, drive, and provides an opportunity to be social. 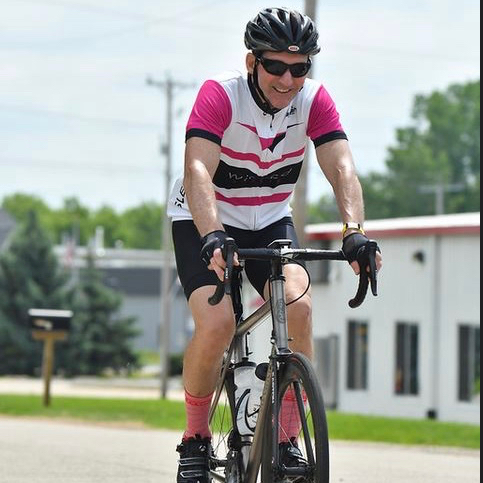 Whether it’s on his Peloton e-riding alongside of his friends in China or attending events like the one last weekend in Wisconsin where he was sporting his Wicked Sheets jersey, Rick has committed to cycling as a regular part of his practice. For him, it’s always Men’s Health Week! He also mentioned, “The jersey is a great conversation starter when riders come up alongside you…’What does ‘sleep wicked’ mean?’ I always get a good laugh and end up making a friend out of it. No matter how you choose to stay healthy — Men’s Health Week is a great way to begin examining the ways you get moving, get sweaty and work on being more fit! The Better Sleep Blog How my Wicked Sheets QVC deal almost went bust.